Below, you'll find videos explaining assistive technology directly related to Vehicle Modifications. 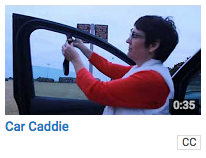 Click the graphic to see a video on the Car Caddie (provided by AT3 Center). 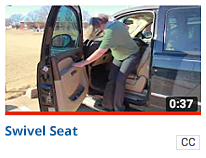 Then, we're including two more videos from other providers: the Swivel Seat (agecomfort.com) and How to: Drive with a Physical Disability (National Center on Health, Physical Activity and Disability). Here's INDATA's YouTube video playlist for Tech Tips for Driving. Note - for safety reasons, we are not able to provide input on appropriate transportation or driving aids for specific situations for children with special needs. The following case studies and sample solutions are meant to provide general knowledge and not be generalized to specific situations. Note: For safety reasons, we are not able to provide input on appropriate transportation or driving aids for specific situations. The following case studies and sample solutions are meant to provide general knowledge and not be generalized to specific situations.